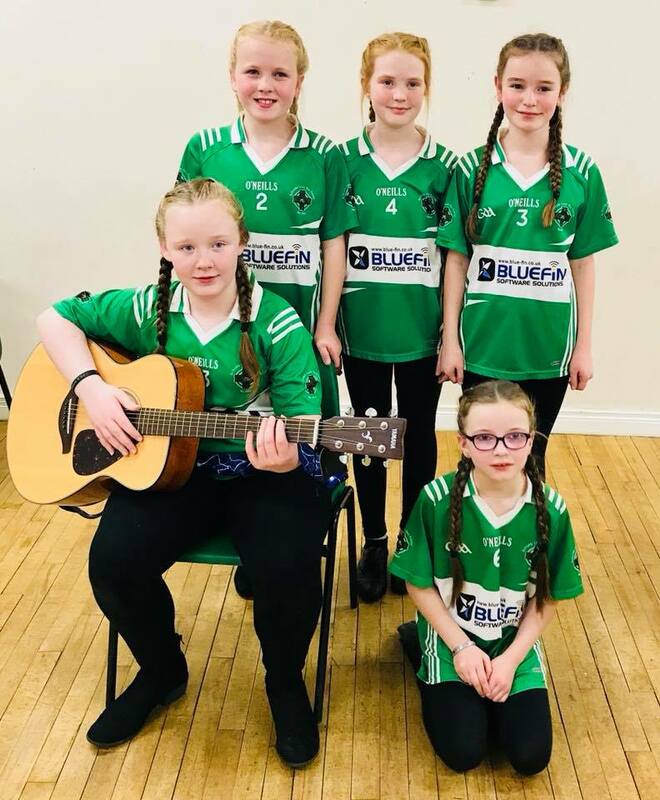 *Fantastic result from our young Scór na nÓg competitors Connee Ní Fhlanagáin, Genevieve Ní Leannacháin, Ellen Ní Coinne, Fionnuala Pickering and Shannon Ní Mhuirí who came first in the ballad category at the Dan Rice Hall in Drumaness last Friday evening. The girls, aged only 8 – 12, now progress to the East Down final to be held in Carryduff this Saturday at 3 pm. To mark their participation in what was the 50th anniversary of Scór the girls also received a special certificate signed by our county chairman and secretary. The Bean an tí for the event was our very own Ciara Pickering and she kept the proceedings running very smoothly indeed. Thanks to Corinne Ní Fhlanagáin for mentoring the girls over the past five weeks and good luck in the final. Ádh mór a chailíní ! Our Scór na nÓg competitors who won the Ballad Group category at the East Down Drumaness venue. They now progress to the East Down final this Saturday. *After three weeks without competitive football a ring rusty Aughlisnafin side bowed out of this year’s U13 Division 3 championship against St Johns. In a high scoring semi final game, which saw 22 goals and 15 points, it was St Johns ability to take their goal chances was the difference on the day. With a few of the older players in the squad unavailable several U11s enjoyed a taste of championship football. That concludes the football for the club for the season. *A meeting for all senior players will be held at Aughlisnafin Community Hall on Thursday 22nd November at 8 pm sharp. Our new management team, headed by Dolen Croskery, would like to meet with all the players to outline the plans for the year ahead. All current players, former players and new players are more than welcome to attend. This season will see another crop of our talented minor players break through in what will most certainly will be a very exciting year ahead for the club. The challenge is there, to be part of something special, to be stronger, fitter and, most importantly of all, competing on all fronts. Look forward to seeing everyone there. Ní neart go cur le cheile ! *The AGM will be held on Friday 30th November at 8 pm in Annsborough social club. The deadline for all returns has now passed. *On Tuesday St Malachy’s High School will be taking part in Gaeilge24. Gaeilge24 is a challenge which encourages pupils to speak only in Irish exclusively for 24 hours, at home, in school and everywhere else. With many fluent Irish speakers within our club, who are both students and teachers in the school, they will no doubt enjoy the ‘G-Day’ experience. Ádh mór oraibh! *Lotto numbers 1, 16, 17, 26. No winners. Jackpot now £3,975.